It’s like something you might see in a princess-themed episode of Mad Men – a ‘60s inspired restaurant space decked out in elegant curved booths and banquettes upholstered in pink velvet, pink walls, pink ceilings. 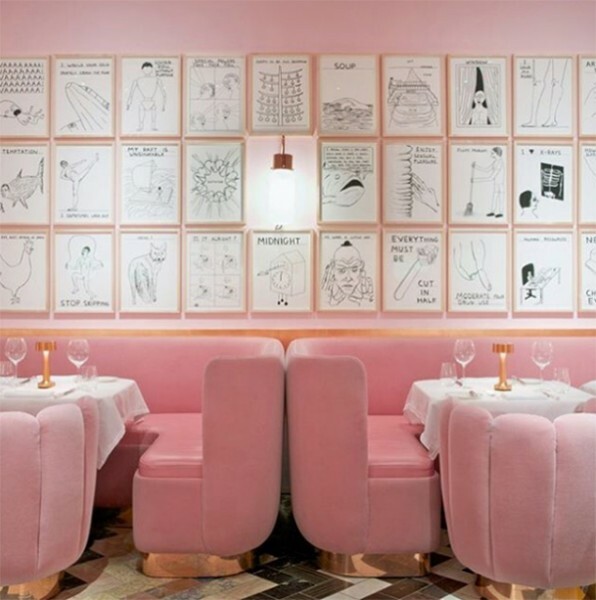 Actually everything is pink except the 239 black and white artworks by British artist David Shrigley lining the restaurant’s walls. The Gallery at Sketch London is a restaurant for art lovers, food lovers and and every day there’s a decadent afternoon tea for little lovers of pink. Every day from 12:30pm to 4:30pm, Sketch in London serves afternoon tea. 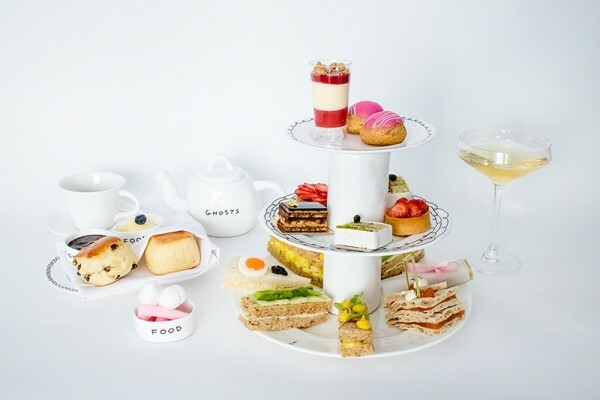 There’s grown-up tea with finger sandwiches and the usual high tea fare, an unexpected Champagne Tea with things like The Veuve Cliquot and vanilla cream tea, and the Children’s Afternoon Tea. When a chef whose other joint has three Michelin stars is overseeing menu, you know the food will be exquisite, but kids, suspicious little creatures that they are, go for something familiar. On the children’s menu there are avocado and tomato, or coronation chicken sandwiches, miniature mozzarella paninis, pastries including a Malabar marshmallow confection, and juice. There’s also a cuddly friend called Pat the Bear to take home. (Real life tip: don’t ever pat bears). Even though it’s British high tea, The Gallery at Sketch is anything but traditional. Works of art adorn the tables in the form of ceramic tableware. Three white salt and pepper shakers sit on tables, and printed on the outside are the words “Dirt”, “Dust”, “Nothing”. The mystery to be solved is whether salt actually comes out of the shaker marked “Nothing”. On teapots is the word “Ghosts” and on cream pitchers, the word “Dreams”. What that means, we’re not sure, but it makes for interesting teatime conversation. If Instagram is anything to go by, all the luckiest Australians are holidaying in Europe right now. If you’re there, put sketch on your itinerary. Sketch is at 9 Conduit Street, London. Afternoon tea is £27 per child, and is served from 12:30pm to 4:30pm in The Gallery restaurant.